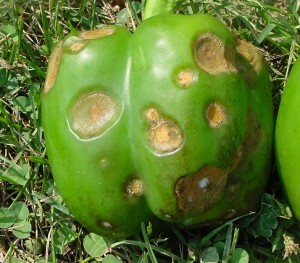 Pepper anthracnose always starts out as a ‘hot spot’ and then fans out with the prevailing direction of the wind. The hot, wet weather and isolated afternoon and evening showers in many areas have been ideal for anthracnose development. If a ‘hot spot’ is found, all fruit (of any size) from the area and from nearly plants should be strip-picked and discarded appropriately. Reducing the amount of inoculum originating from the initial source (i.e., hot spot) is critical for managing pepper anthracnose. Growers should apply high rates of chorothalonil or manzate in a weekly rotation with chlorothalonil or manzate + Quadris (azoxystrobin, 11) or chlorothalonil or manzate + Cabrio (pyraclostrobin, 11) with a high volume of water to ensure adequate coverage. Organic growers need to be extremely diligent and make sure to remove all potential sources of inoculum. Weekly OMRI-approved copper applications may help suppress anthracnose.